This page is a summary of the postal codes of Switzerland and Liechtenstein. The countries use four-digit numeric post codes, sorted by geographical location (from north to south, following railways and post car routes). The Swiss postal codes are assigned geographically, from west to east. They don't follow political divisions (cantons, districts), but they follow a routing allocation, following railways and post car routes. The postal code of big cities finish with 00, and it is not allocated if in the region there isn't a big center. Today, the third digit has no real meaning anymore. In the past, mail was assigned to fixed railway or truck routes, but modern logistics do not need this practice anymore. Postal codes of Liechtenstein are included in the same structure, using the range from 9480 to 9499.
the Italian territory of Campione has the postal code 6911 for mail passing through Swiss post. also located in Italy, the Swiss Post office in Domodossola has the code CH-3907. the German town of Büsingen am Hochrhein has been attributed the postal code CH-8238 for mail arriving directly from or passing through Switzerland. 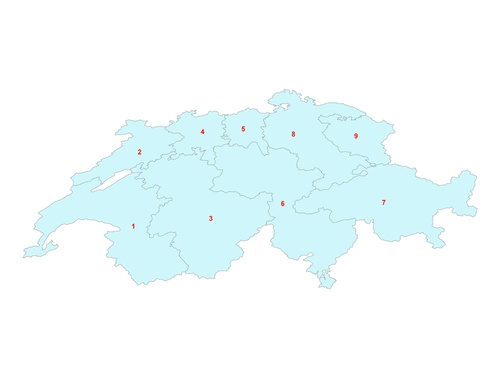 One-digit postcode areas Switzerland, defining the first digit of each four-digit postcode. 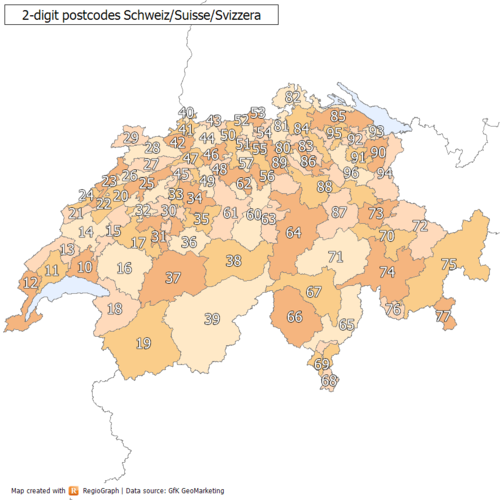 Two-digit postcode areas Switzerland, defining the first two digits of each four-digit postcode. 80xx: The city districts of Zurich were numbered before the Swiss postal codes were introduced; the number of the city district equals the last numbers of the postal code. The administration of the canton of Zurich has the postal code 8090. 3003 is the postal code of the Federal administration which is located in Bern.